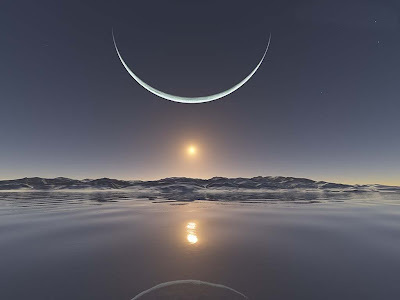 To day I remember that the Winter Solstice was perhaps the earliest universal holy day, celebrated in different ways in different places throughout the world from the earliest days of human culture. 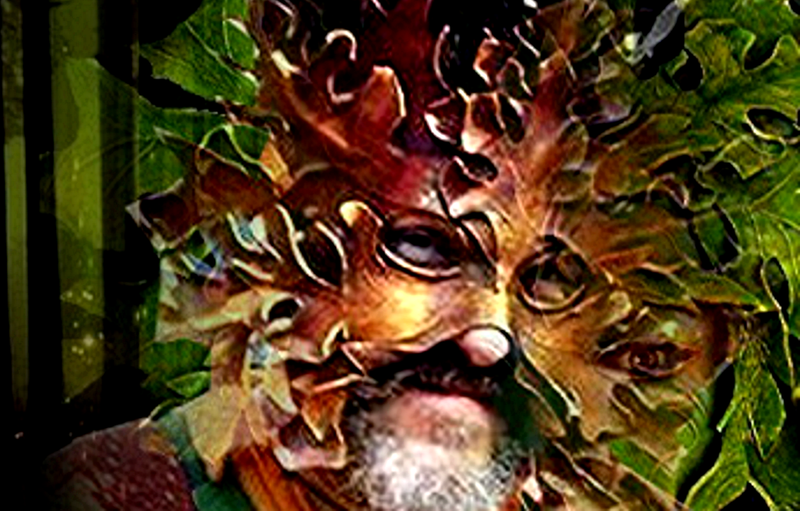 When language was young, when even the gods and goddesses had not yet taken human forms in the human imagination, but ran instead with deer in the forest, flew with the wings of crows, or were glimpsed nameless from the awed depths of every numinous pool........ even then, this was a holy day, a day of celebration. Long ago ancestors lit fires before cave homes to welcome the shining god who was the sun return from mysterious underworld depths. 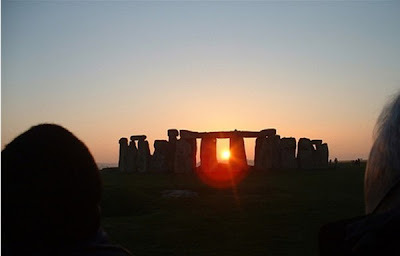 They built stones or made circles or created doorways to be aligned with the sun's pathway. They left offerings of food to show their gratitude, they invented songs or danced throughout the long cold night, grateful, encouraging, hoping to help the Sun on his difficult journey to the promise of new life. I remember today that holy days begin among our most ancient, instinctual roots, taproots that reach down, deeply entwined within the visible and invisible web of life. Planet Earth turns her face toward her star again, circling in brilliant orbit, bearing every evolving, responsive, living, infinitely conversant be-ing within her fragile, exquisite azure skin on her long journey. Perhaps I can regain, for just one instant, that pre-verbal, instinctual animal knowing, found beneath the pages of any book written with five fingered hands, beneath each inscribed layer of words, signs, hieroglyphs, pictures in jet or ochre or sepia, the primal light, luminous beneath the oldest pages. Veneer peels away, revealing a pentimento, an ancient heartbeat, shared again with all beings that keep vigil on the night of the winter Solstice. The light is returning again. I feel very honored that I received an email from a personal heroine, theologian Catherine Keller, who wrote "From a Broken Web - Separation, Sexism, and Self", the passionate, visionary book that has been a source of inspiration for me. I leave grateful on many levels. 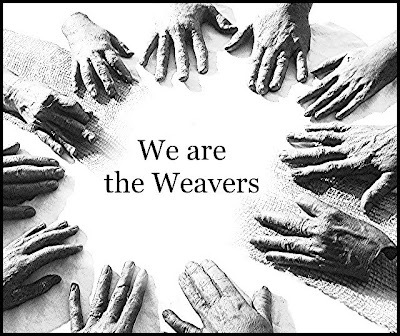 "What an honor to be thus woven into your healing web! I love your combination of the themes of Spiderwoman, eyes and hands—vision and action. Interesting how the web metaphor keeps unfurling. I was uncomfortable at first with the WWW, but get its potentiality for transformation too. And these days quantum entanglement rocks me with its cosmic web of instantaneous linkages. I also appreciate the earthiness of your medium. You are truly enacting the oscillation of vision and hands in the content and the process of your work. " Catherine Kapikian's hands, "The Weaver"
"Eventually, I found what I was looking for. Layers of petroglyphs on adjacent rocks.....it was a place that seemed infused with numinous power. 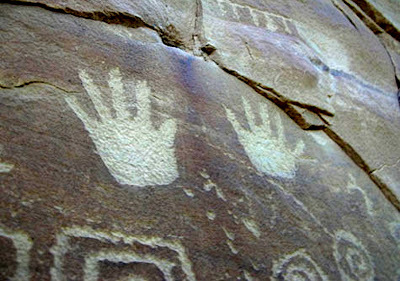 And scattered throughout, like a motif or underlying texture, there were hands, painted or incised on the rocks. 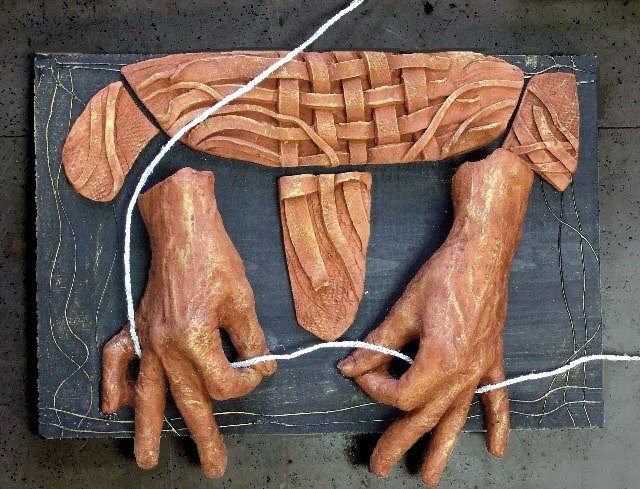 I wondered, why the hands? Hands among hunters and big horned mountain sheep, near metate holes that once ground mesquite, protecting solarized shamans in their ecstasy, seeming to touch odd shapes and circles. 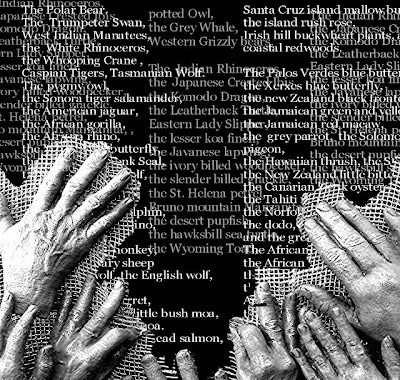 Shadow hands scratched into the rocks, weaving stories as they were being told, touching me now from the prehistoric past. Yesterday, while sitting on a curb, a little whitish spider came walking across the pavement, stopped right in front of me, and raised its front legs several times, which was about the only gesture Spider could have made, definatively, if it wanted to say "hello". Because I noticed, I radiated delight, and we sat thus in companionable mutual observation, until I had to leave. This occured, I have to add, while on a cell phone to a distant friend in California who is one of the few people I know who also is delighted by magical encounters with animals. I note this because, like dreams, all things occur within a context. I thanked the spider and felt somehow encouraged. I've been troubled of late, and I've been having dreams to ponder, after years of sleeping like a stone, dreamless. I watched her wander off, pursuing whatever it is that spiders pursue after having concluded an appearance as a very small, divine Messenger. In the worldview of people like, for example, the Sami shamans of Norway and Finland, all life is interconnected and conversant. And symbolic, interpenetrating and in context with the dimension of dreams. 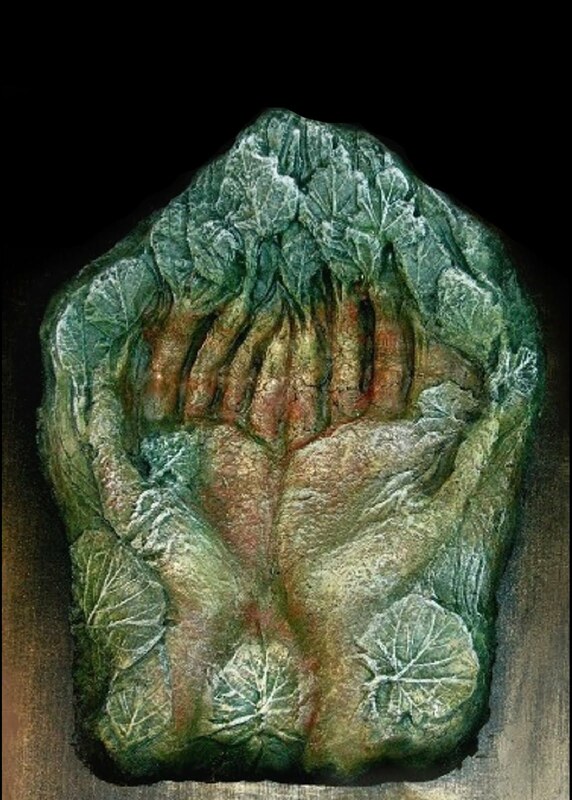 Artist Rafael Ortiz called this "paleologic", a holistic form of consciousness shared by many indigenous peoples throughout the world. 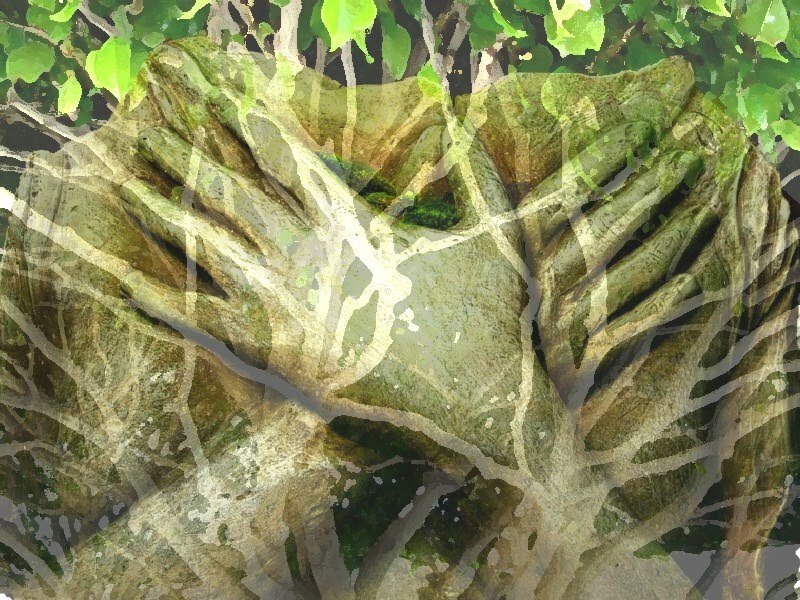 Dismissed as "animism" , today these archaic forms of "primitive magical thinking" are being examined by the leading edge of transpersonal psychology and consciousness studies. A spider can be just an insect.....or, an ally that brings encouragement on a wintry pavement....just as an angel in a dream might bring a message of hope. It's all in how your paradigm, personal and collective, allows you to see it. 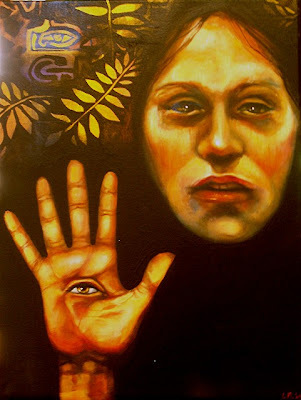 I remember reading an article by Gloria Feman Orenstein, a writer and professor of women's studies at USC, who apprenticed with a hereditary woman shaman of Sami land in the 1980's . In writing about her experiences, she noted that, when in her home in Los Angeles, if some kind of contact needed to occur with her far distant mentors, mosquitoes would usually turn up. 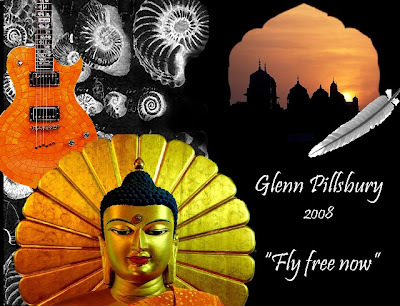 When we see the world, and our participating within the world, "in a sacred manner", when we can imagine that all dimensions of life are sacred and interpenetrating, then it's possible for all beings to become part of the conversation - even mosquitoes. 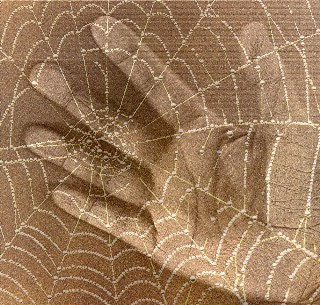 ** Or, friendly little spiders, reminding me that a "webbed vision" is something that has to be continually renewed, in mind, and in heart. as if the river shores were opening out. I feel closer to what language can't reach. ** "One of the main features of summer in Sámi land is that suddenly the marshes become swamped with mosquitoes. The Sami love their mosquitoes, because they realize that "the white man" cannot stand them, and so the mosquitoes have, in some sense, kept their land from being taken by outsiders. Most people cannot bear to live with those mosquitoes. As I mentioned before, Sami Shamans communicate with their mosquitoes, and they understand that they can be messengers, guides, and protectors." While surfing for "environmental art", I found another Circle of Hands, this beautiful photograph created by participants in an environmental arts festival in Iran, in 2007. 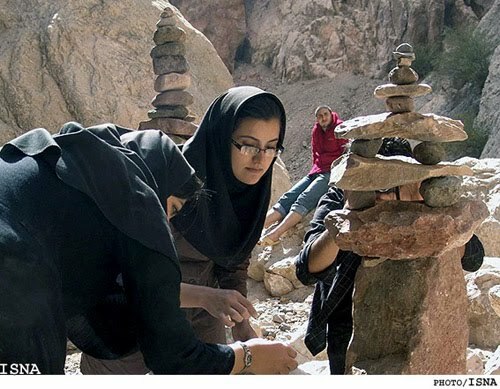 For information, visit the story by Iranian Radio. 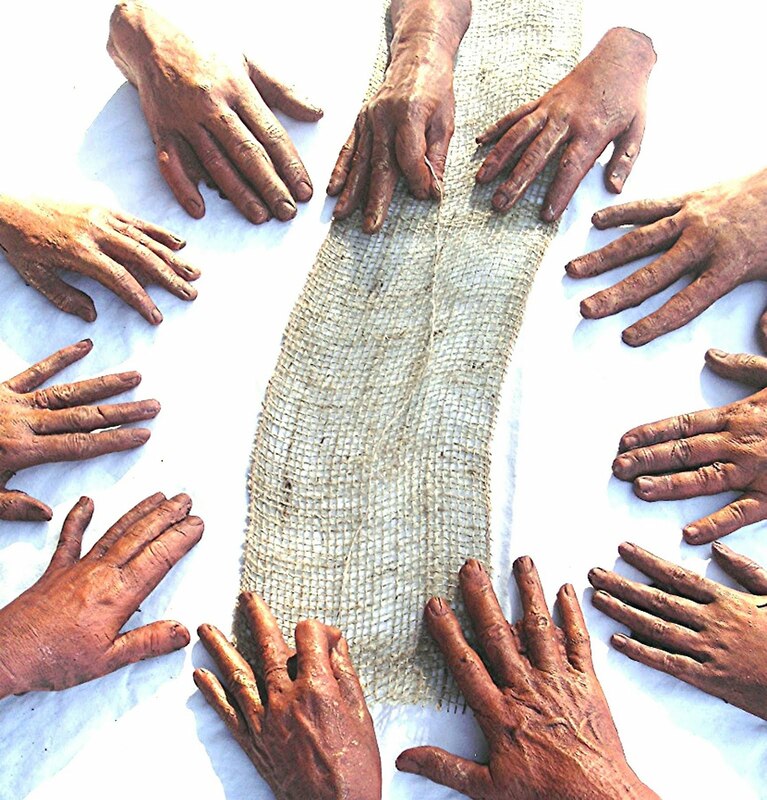 The story and images are also to be found at the Green Museum. 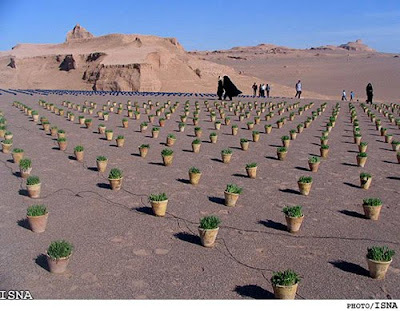 I found this image so striking I wanted to share it, and the story of these students creating this festival against the desert (kavir) landscape. That it took place in Iran, all the more so. I take the liberty of copying text and images from the post here. 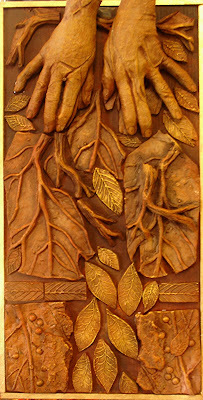 For information on environmental art, also visit the Green Museum's Blog. 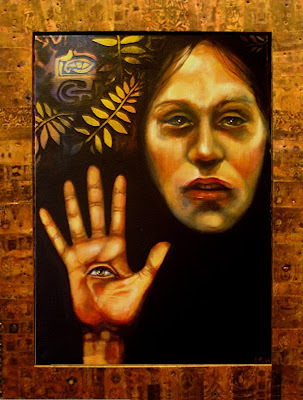 Below, I list more great links to Earth Arts websites and blogs. 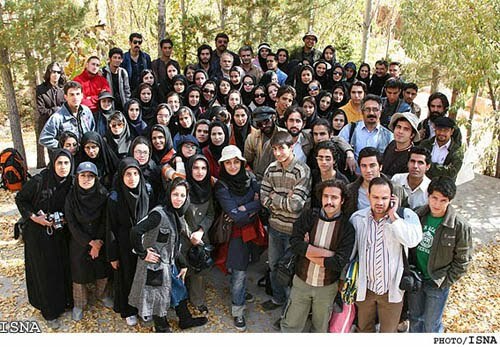 "The festival began in Vahdat Hall at Shahid Bahonar University in Kerman, with speeches and discussions on the concept of environmental arts. On the third day of the festival artists gathered in Shahdad Kavir and presented their works in a kavir (desert) background. This area is one of the most attractive outlooks of Kavir because of its statue-like walls called "clot." 200 young artists and art teachers of Kerman Province joined the festival. "As if to help us change our perspective on war, discoveries within quantum physics suggest the belief that we can achieve a position of dominance in relation to nature, life or each other is, ultimately, an illusion. Each of us is an expression of a vast sea or field of consciousness - invisible, and as yet barely recognised by us. 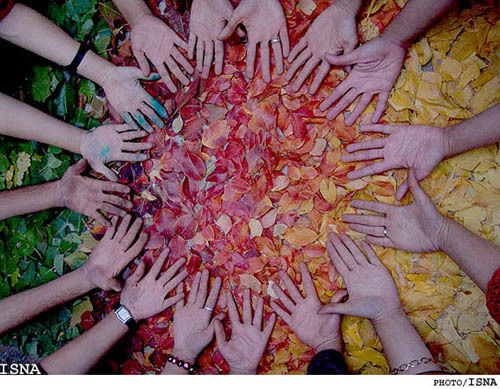 We are all connected to each other through our participation in a great living web of life. It would seem that we are, literally, "our brother's keeper". 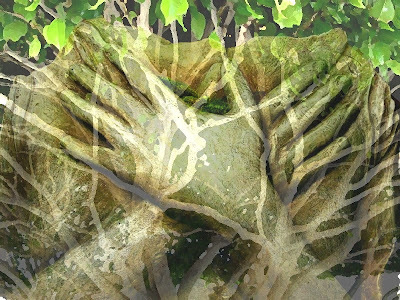 Anne Baring, "The Web of Life"
We could rise up rooted like trees." I felt like sharing the environmental art of Daniel Dancer, who has organized thousands of people with his "Zero" circles, and "sky art" projects. His primary medium is human beings. I've seen clear cut forests: it is something you never forget. For more information visit his website, or read his important article on the Interspecies Arts website. I'm delighted to discover this site.......it's so good to read about so many "conversations with the Earth". "Twelve Children and eight adults gathered in an immense clear cut near Homer to complete this circle. At the center of the circle was a life-size bear mounded from living moss and lichen. Clear cuts, like this one near Homer, take an exceptionally long time to heal. Dancer's comments about the logging of forests to produce paper pulp to fund schools in Washington state was an especially poignant irony. How can we educate the future with the proceeds of wasted forests, destroyed landscapes, ravaged soil, by cutting down the very breath of the planet? "This circle was constructed from catalogs sent to one home in the holiday season between Thanksgiving and New Years. The Washington State Department of Natural Resources manage thousands of acres of forest trust lands with a mandate to fund the construction of schools. The time has come to question this practice. Does it really make sense to log valuable forest habitats to fund schools? ............Does it really make sense to log nearly half of America's forest to make paper pulp? Direct mailers gobble sixty-eight million trees per year. Half the received envelopes are never opened. " I also appreciated the simplicity of his comment about "art", from the "Zero Circles" project site, wherein he invites participants to become co-creative artists. As a professional artist, I'm always amazed by the ways people are intimidated by the notion of "art". "First of all, don't be intimidated by the word "artist." In an earlier time, art was not something others did for us to view, or purchase to display on the walls and tables of our homes. Instead, doing art was a part of life. It empowered us. It gave meaning to our lives and connected us to the whole. Rediscover the connection art once provided and build a circle in a national forest near you." Circles are many things, but most of all, Circles are inclusive. They contain, like the spherical shape of our Revered Earth, the whole of life. Circles have no end. 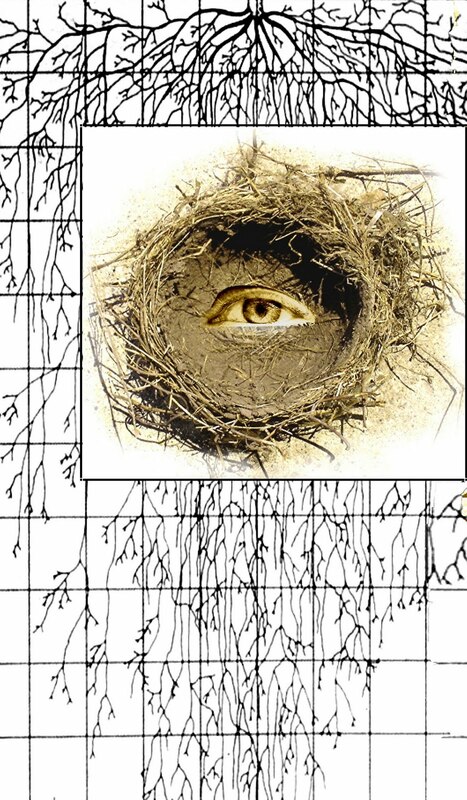 if we saw with a webbed vision? Catherine Keller, "From a Broken Web"
of this unified earth as of one harmonious being?" I'm almost finished with my "Weaver's" sculpture, which will be installed in the staircase entryway at Wesley when some details are completed. The sculpture, mixed media and terra cotta clay, was formed from casts of Wesley staff and students. All arts, like dreams, have different layers of meaning. 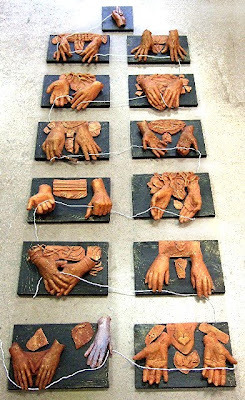 As I worked, the "story" of this progression of hands became clearer to me. It is dedicated to the ongoing collaboration of the community here at the Luce Center. For me, it's also a new “telling” of my exploration of the story of the Spider Woman. 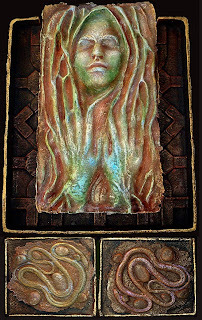 Spider Woman is the weaver deity found throughout Native American mythology. It’s said that all stories originate in the mind of Spider Woman. 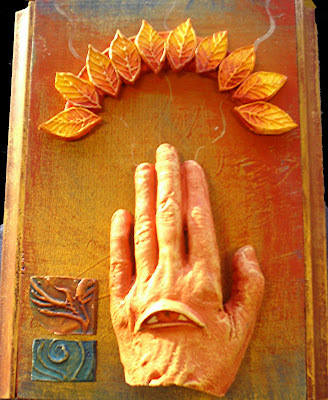 The "Hand and Eye" is the hand of the Divine, from which all inspirations come. This piece is about the evolution of an idea, and so the first pair of hands, "The Weaver", belong to Cathy Kapikian, who retired this year from the arts program she founded. Without her vision the Luce Center would not exist. 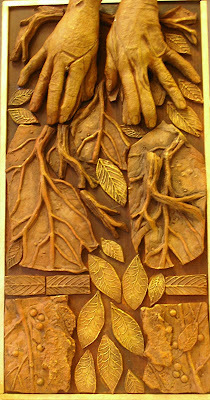 The third panel, "The Seed Planter" seemed a fitting progression: all inceptions need visionary collaborators, people who find the means to "ground it into the soil." 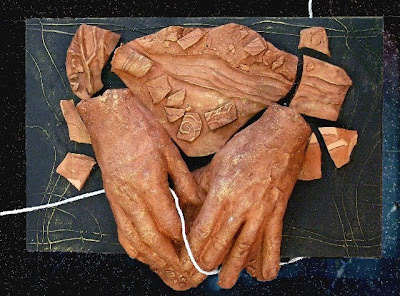 I made tiles based on stories told me by the people who volunteered to have their hands cast. For example, Mr.Tortorici told me that his family came from a village famous for growing olives, and so I made him an olive branch. Ms. Oden, who is the Dean, told me she missed the wild storms of her homeland, Oklahoma....and so I had fun inscribing a storm scene on her panel. Dr. Hopkins is an archaeologist, thus his panel had pottery shards on it. Mr. Soulen is a banjo player, and also a bee keeper, which is why I put a flower on the neck of his instrument. Doug Purnell is a painter, the other resident artist with me this term. Olaf, who is from Iceland, makes her art from fabric and is a gifted seamstress. 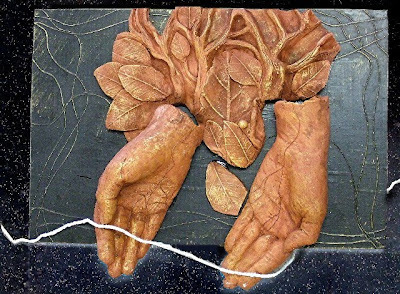 And Amy Gray brought the Gardener's graceful hands, offering the metaphor of the flowering of an idea and co-creation. Finally, I included the hands of Colleen Nelson, who has been a community activist and advocate all of her life. Next to last, those of Deborah Sokolove, the new Director of the Luce Center. 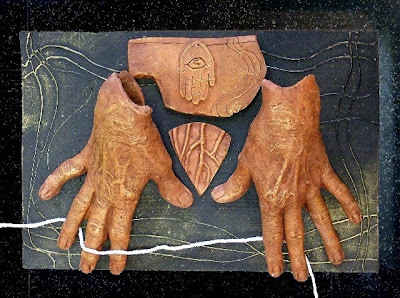 Deborah says of her own artwork that they are "prayers made visible", and so I titled her panel (she made her own tile) the "Iconographer". Because that is what an Icon, to me, is. "Planetary consciousness is knowing as well as feeling the vital interdependence and essential oneness of humankind and the conscious adoption of the ethic and the ethos that this entails. Its evolution is the basic survival on this planet." One to tend growing trees, to insure they will be fruitful. And nothing can be woven true without understanding the past. Music brings harmony and sweetness, bees and gardens collaborate to flower. A seamstress is one who fine tunes the fabric, mending tears, while activists bring justice, attending to threads that are broken. I grew up with a Native American painting that belonged to my father that fascinated me. 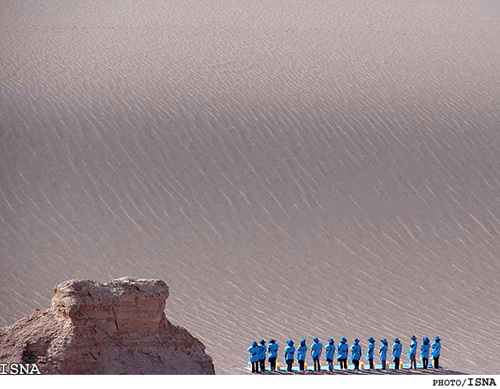 It showed a herd of horses running across a desert. One of the horses, my favorite one, was turquoise blue. 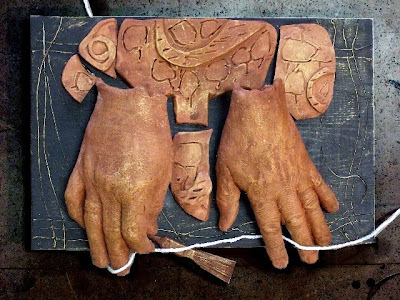 When I assembled my panels, I found I had an "extra hand" from the cast of a child. I remembered that painting. The artist used the blue horse to show the presence of Spirit. And so the last panel is for those who are young, who will carry on and weave anew the threads we weave. And for those who are not yet born. The thread has no beginning, and no end. "It seems as if we have been placed in an alchemical retort, forced to live through the fire of transformation, for the most part, unconsciously.........The new myth coming into being through the triple influence of quantum physics, depth psychology and the ecological movement suggests that we are participants in a great cosmic web of life, each one of us indissolubly connected with all others through that invisible field. It is the most insidious of illusions to think that we can achieve a position of dominance in relation to nature, life or each other. In our essence, we are one." She will seal us with Her seed. I can't believe that in a month I'll be heading west again, back to Tucson. I wish I could remain on the East Coast, see the snows and the spring come. I left my heart in the East a long time ago, and can't seem to drag it into the arid lands. My sculpture Weavers is laid out on the floor of the studio, and will soon be finished and mounted at Wesley. I was amazed to see that after I assembled it (it's about 9 feet tall) it had a cohesive story within its structure. Of course, I had to lay it out to see that! More later, when I have some photos. 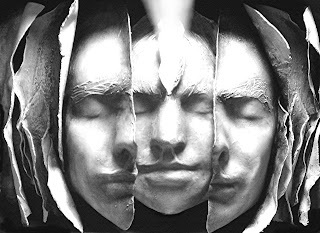 The first deities of Rome, before they became an empire or had adopted Greek mythologies, they called "numen", roughly translated, "spirits of place", the "mind of place". These early deities included Pomona, goddess of the Orchards, and many other local deities concerned with the well being of trees, springs, deer, etc. As I think about creating my personal Icons, I return to the intelligence of nature, the "numinous". Sometimes I see that the Deity I felt in the woods as a child, the conversations I had with beaches and stones and butterflies, are not entirely lost to me. There are still places I can go, where those friendly and mysterious voices still invite me to join the conversation. The divine is beneath our feet, in the roots, the cracks, the dragon trails of wind and rain moving across the expressive faces of the day. 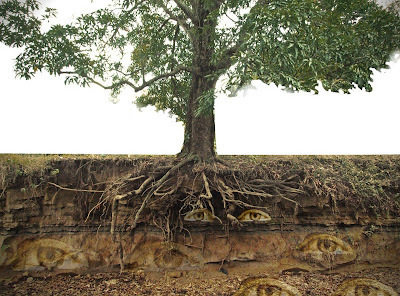 I like this image, I think the eyes mean to me that immanent presence, that intelligence I feel in nature. 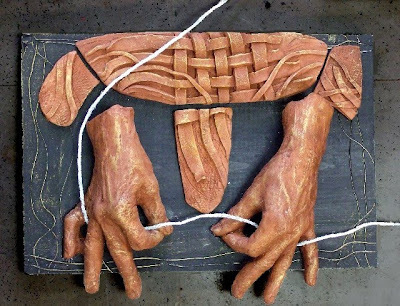 There is a show at the Dadian Gallery here at Wesley, Icons in the American Style with artists Peter Pearson and Thomas Xenakis (October 28 - December 18). Last week they had an opening, and a lecture about orthodox Christian icon painting. Thomas Xenakis said in his artists statement, "The contemplative time during the painting of the icon is most important for me. 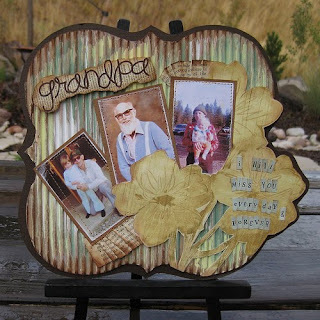 I do not allow the product to overwhelm and pressure the process of the making.......the comfort and peace I glean in the writing of an icon transcends definition." Mr. Xenakis is a contemporary contemplative, whose traditional icons are for him a way of praying. In quoting him, I put my own emphasis on "product" and "process". The word "product" encapsulates, for me, something so intrinsic to our economic and value system that it can quickly overwhelm and overshadow any form of authentic expression. We're bent on production, at ways to keep generating objects and means, at quotas and, under it all, commercial value (do I sound a bit world weary here? )......all of this can "de-soul" a work of its vital essence in no time at all. The vital essence is the process and intention immanent within its creation, and more subtly, the energies that become focused and generated as the "object" manifests in some kind of material form. Does that make sense? 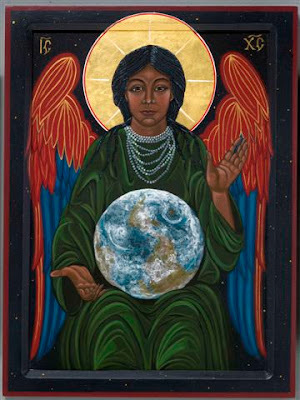 Peter Pearson, in his artist's statement, says: "Ultimately, the best icons do not draw attention to themselves, but to God.........So the work of a faithful iconographer is not about anything other than creating an image that will invite and facilitate that movement." In my studies of indigenous masks ( like the sacred mask traditions of Bali), my fascination with Navajo and Pueblo weaving, and traditional Icon arts, I see my own life-long quest for a spiritual meaning, and vitality, I have never found within the modern art world. A longing to discover the "holy" roots of art. I use parentheses for that word because I don't mean it in any denominational sense, but I do mean it in the mystical sense. A sacred mask, in traditional Balinese society, "belongs to the gods", is kept in the Temple except when used for ritual theatre, and were maintained, and protected, as "vessels for the divine". That inspired my 10 year project of making masks for the Goddess, my own devotional offering to the Divine. I think of the Navajo tradition of leaving some small piece of a rug flawed - because only Spider Woman is a perfect weaver. Gold is the most highly valued metal in the world. When an icon is painted on a backdrop of gold, when a halo is created with gold leaf, and especially when an icon is framed in gold, using alchemical metaphor, the icon is saying that this vision is taking place against an ineffable background, infinitely precious and purified of "dross". To surround an icon with gold was to sanctify it, creating a window or portal into a sacred vision, a sacred space. 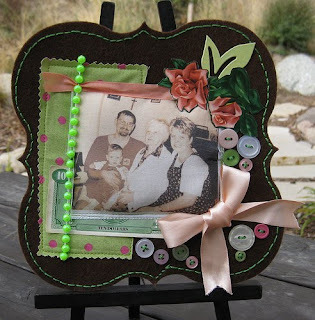 A sacred work of art can be a potent receptacle for energy. This was exactly why sacred masks in Bali were kept in the temples, and performers were anointed with holy water before and after using them. 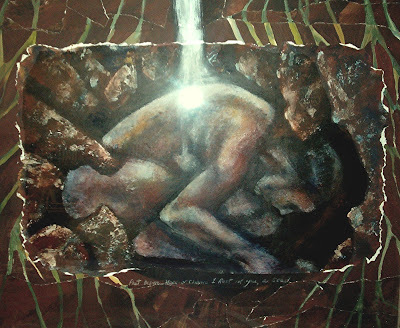 It's also why icons are often associated with special places of geomantic potency, such as sacred wells or caves. Here's a wonderful commentary by Martin Gray, in his truly epic book, Sacred Earth: Places of Peace and Power. 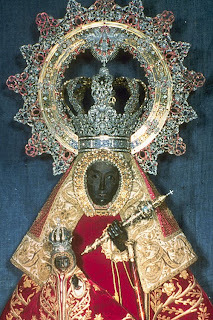 He is writing about the Black Madonna of Guadalupe, Spain, the object of a millenia of pilgrimages. "It is important to consider the legendary description of the icon as having miraculous healing powers. How are these powers to be explained? 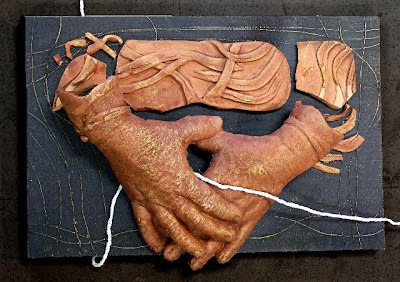 The current author theorizes that the healing powers of certain icons, statues and images derive in part from their capacity to somehow function as both receptacles and conduits for some manner of spiritual or healing energy. To grasp the implications of this concept, consider the matter of how physical objects, upon being exposed to various types of energy, may actually build up a charge of that energy and then radiate the energy back into the environment. For example, a stone after being removed from a fire continues to give off radiant heat, and a battery having been charged with electric energy thereafter has the capacity to conduct that energy into an electrical appliance. Perhaps, in some currently unexplained manner, sacred sites and sacred objects are able to gather, store, concentrate and radiate energy in a similar way." I am not saying in this entry that "all art" has to be sacred, all art has to have contemplative or spiritual intention. We would have a very dull world, with universal scapegoating and projection, if there was no room for the secular and profane. Heretics would be much in demand. But its no secret that modernism has gone way, way too far in the other direction. We live in an increasingly de-sacralized world, a disposable world, to our collective sorrow and immediate peril. There are times when I feel overwhelmed with it, overwhelmed with the numbness and indifference, the "sound of silence." ** I hate the hard edged cynicism people give to the "new age" explorations of the '80's. Yeah, there were certainly excesses, exploitations, and lots of naivete, but is there any public investigation that doesn't have these frailties? I have held many a crystal, and many a "talisman", in the palm of my hand and felt it change my affect and energy system. Radios and computers are basically utilizing crystals - "Silicon Valley"? How do we "see in the dark"? What happens when things are obscured, hidden, not illuminated with predictable means? What other kinds of vision, what "night vision" do we need to cultivate? Here's my not quite yet finished "Butterfly Woman". I really like her, she makes me smile. For one thing, I love the Hopi notion of the Butterfly Dancer as a mature woman with the strength of experience necessary to do the work of pollinating the future. This is a job that requires weight, depth, good humor, and "las ovarias" (as Clarissa Estes would say). And I also enjoy stepping on three art world taboos in this painting. (this residency has put me through the wringer, as far as "art world identity" goes). One, it's an old woman instead of yet another pretty woman (usually naked). And that's not how I see the Goddess either. 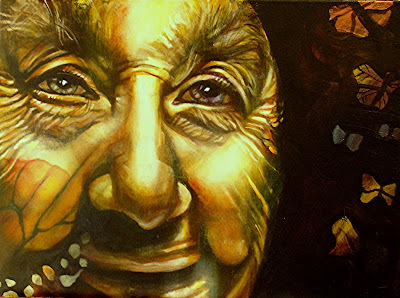 As a woman of 60 now, I'm feeling completely inspired to paint women and men who are lit up from within by age and experience, the external shell beautiful and withering. Two, she's smiling. It's almost de rigor, as I remember from those endless art critiques of long ago, not to mention perusing art magazines, to portray serious, if not angst ridden, be-pained faces. Third, the thing has butterflies. That's because it relates to the Hopi legend, and also I've been thinking of the short story I wrote in 1997, "La Mariposa". 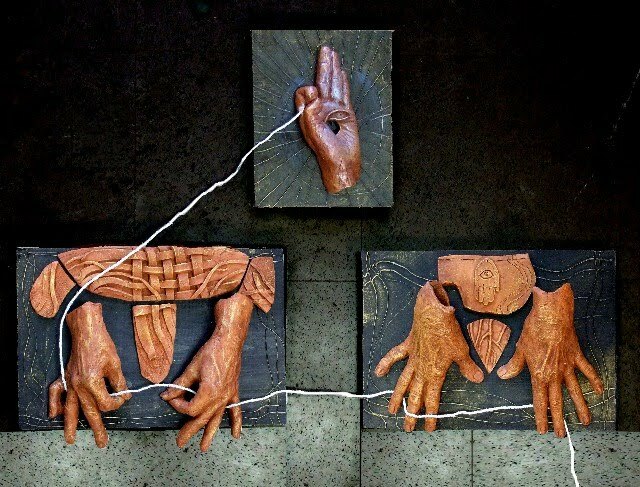 This is an assemblage study for the big "Weaver's Hands" piece I'm going to do. I like the way it turned out. 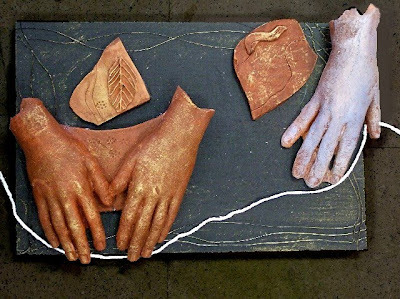 I wish I had a kiln here, so I could do some more clay work. "There's a crack in everything"
This, of course, was one of those happy accidents that became a visual poem based on a poem by Leonard Cohen. I have some photos of myself that I am thinking of doing some black ground self portraits with. They aren't flattering. I have in my mind the image of opening the heart chakra, opening the chest cavity, to "let the light in". Or not, just the act of opening is good enough. Or, to let the curling, twining, vegetative green heart out, like roots, the tendrils of vines, the pollen that needs to pollinate. Or, like a tree unfurling, emerging from the inner life, flowering. their faces familiar and serene. haunting the borderlands of our lives. and the Hero's sacred journey home. and commemorate their loss with honor? A poem? A stone to mark their passing? It was moving last night to participate in a candle ceremony at Wesley, connected to the Dia de los Muertos altar that I and my class made this past week. I thank Deborah Sokolove and Dennis Crolley for initiating the ceremony. I lit candles for my brother, friends lost in the past several years (including animal friends), and a candle as well in memory of all the species endangered and extinct as humanity continues to overwhelm and change the life webs of our world. I mourn the loss of all my fellow life. I was thinking, as I do at this time of year, about remembrance and honor. 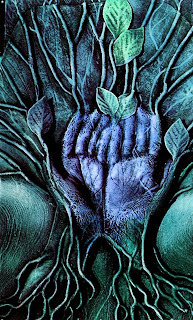 "What is remembered lives" is a chant from the Spiral Dance, and like to think of it in terms of re-membering as well, re-joining and re-connecting what is part of a whole. 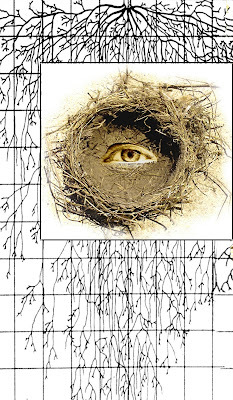 That's what a "webbed vision" means to me - to see the links, to seek out the connections, aware of a lattice of interconnection that continually expands beyond our limited personal views. Seeing in inclusive instead of dissecting ways, in terms of relationships and reciprocities. I think honor is a very important word, particularly within this understanding. If we cannot honor the unknown ancestors who made it possible for us to live, if we cannot honor the people, living and dead, who have informed our lives and experience in every way, if we cannot honor even the animals and plants, which are not "commodities", but living beings, whose bodies and lives made it possible for us to live......if there is no honor for this intimate and also vast web of giving and taking, of exchange of energy, of relationship ........if there is no honor, there is no cohesion. The center cannot hold. A few years ago, I began receiving some well meaning New Age emails from a group called "Go Gratitude" that was promoting gratitude as a worldwide cause (along with perky emails to circulate, and a necklace with their logo you could buy.) There was some of the magical thinking in their program I associate with "The Secret", which implied that with an "attitude of gratitude" (and positive thinking) one could also achieve "abundance" ...and presumably get the things one might desire. While I appreciated them, I also found it kind of appalling that all those slogans and "abundant more-ness" (since we are a society that cannot do something unless there is a suggestion of profit) were deemed necessary to promote a fundamental virtue. Foundational, and profound. To me, gratitude is the only logical response, the only remaining affect, one can arrive at when understanding and vision has expanded beyond the most limited and immature means. Gratitude, in other words, is the natural outcome of any kind of spiritual maturity. I remember that Carolyn Myss, in her book Spiritual Anatomy, commented that honor and gratitude were like the backbone, the skeletal structure upon which an individual builds his or her sense of purpose within a perceived community. Without a sense of honor, it is hard to "stand" or to have "standing". 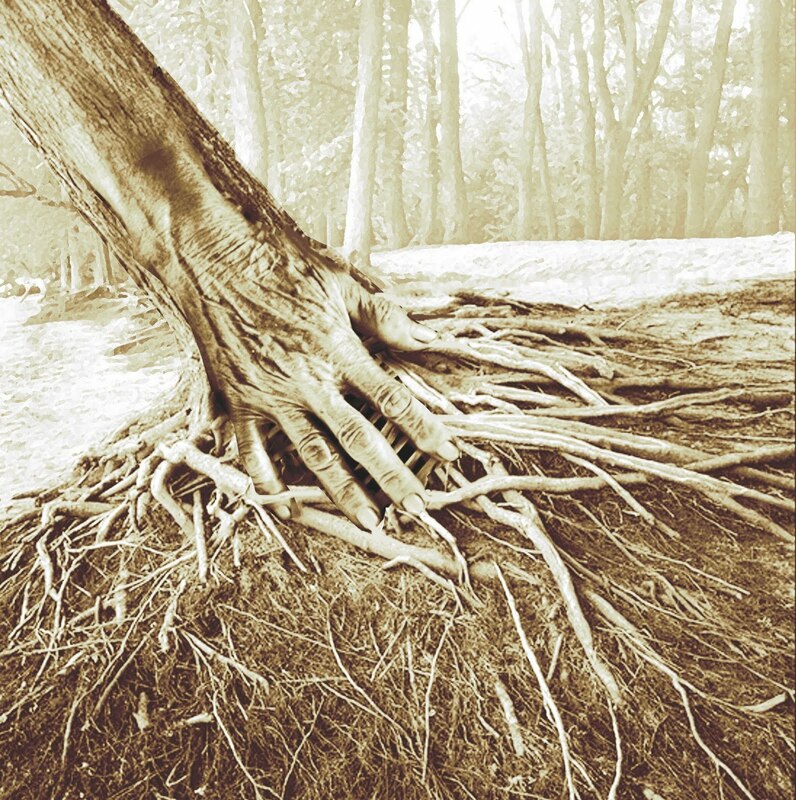 To comprehend that our life stories are woven into a vast tapestry, a continuum, a greater whole that somehow, even when we cannot see it, lends "holiness" to our lives. Lends an appreciation, a comprehension, of the "whole". "In 1987, the last Dusky seaside sparrow disappeared from the earth. Imagine the people of Merrit Island, Florida, gathering to hold vigil on the marsh's edge each June 15, the anniversary of it's passing. Or imagine the citizens of San Francisco gathering in the spring, beneath rustling eucalyptus trees at the Presidio, to remember the Xerces blue butterfly. That was where the last one was seen in 1941. Can you imagine the California condor, it's wings circling in the desert air? Can you hear a Mexican Grey wolf, howling in the night? Psychologists have not begun to ponder the emotional toll of the loss of fellow life. Nor have theologians reckoned the spiritual impoverishment that extinction brings. To forget what we had is to forget what we have lost. And to forget what we have lost means never knowing what we had to begin with." 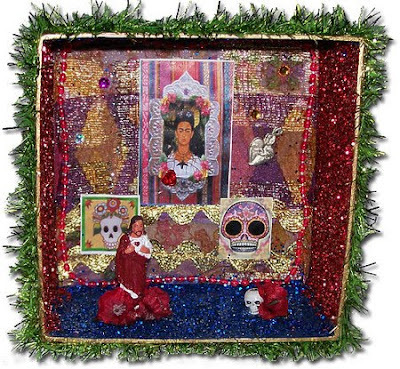 Día de los Muertos is on November 2nd, with celebrations beginning on November 1, (Día de Muertos Chiquitos--The Day of the Little Dead) ( also All Saints Day) and continuing on November 2, (All Souls Day). It is a joyous occasion when the memory of ancestors and the continuity of life is celebrated, and a beloved holiday in Mexico and South America. Like the Celtic traditions of Samhain, which were also associated with the end of the year and the last harvest festival, it was believed that at this time of the year the souls of the departed can return to visit the living (the "veils are thin"). It is not a time of mourning since, as the Latin saying goes, "the path back to the living world must not be made slippery by tears". Celebrations for the dead originated in indigenous Mexico before the Spanish conquest. Following the Spanish conquest of Mexico during the 16th century there was a blending of indigenous customs with the new Catholic religion. All Saints' Day and All Hallows Eve (Halloween) roughly coincided with the preexisting Día de Los Muertos resulting in the present day event. Although the skeleton is a strong symbol for both contemporary Halloween and los Días de Los Muertos, the meaning is very different. For Días de Los Muertos the skeleton is not a scary or macabre symbol at all, but rather represents the dead playfully mimicking the living. 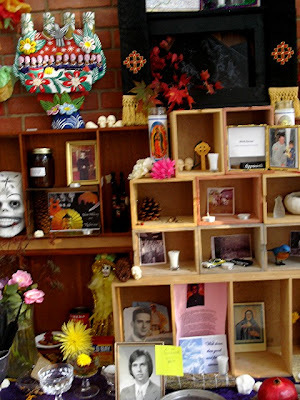 Very often, a large community altar may include many small personal shrines, such as the one below that includes Frieda Kahlo. Or this simple "box" shrine. Preparation begins weeks in advance when statues, candies, breads and other items to please the departed are sold in markets. 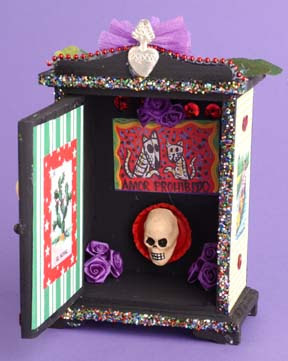 A sweet bread, pan de muerto, with decorations representing bones is very popular, as are sugar skulls made from casts. All sorts of art objects and toys are created. This gives the economy a boost in much the same way as our Christmas season does. 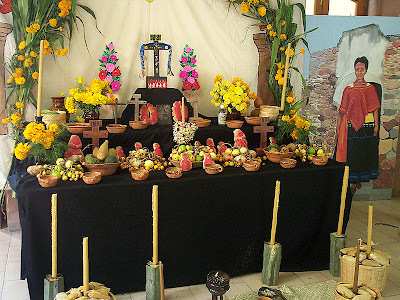 Alters ofrecetas (offerings) are set up in the home with offerings of sweets and fruits, corn and vegetables, as well as the favorite foods and beverages of the deceased. It's not unusual to see a good cigar and whiskey bottle beside a photograph of a loved one. These offerings may later be given away or consumed by the living after their "essence", and the loving remembrance, has been enjoyed by the dead. Marigolds are the traditional decorative flower. The particulars of the celebration vary widely. 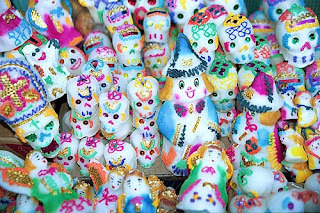 On November 1, Día de Muertos Chiquitos, the departed children are remembered. 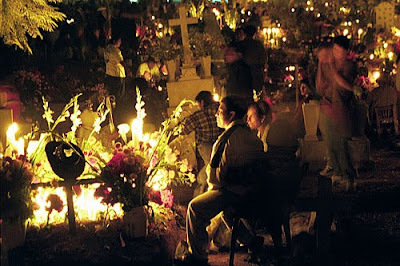 The evening is sometimes called la Noche de Duelo, The Night of Mourning, marked by a candlelight procession to the cemetery. 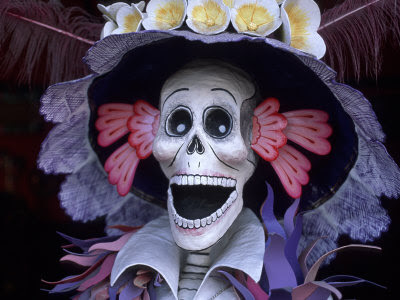 On November 2, Día de los Muertos, the spirits of the dead return. Entire families visit the graves of their ancestors, bringing favorite foods and alcoholic beverages as offerings to the deceased as well as a picnic lunch for themselves. Traditionally there is a feast in the early morning hours of November 2nd although many now celebrate with an evening meal. 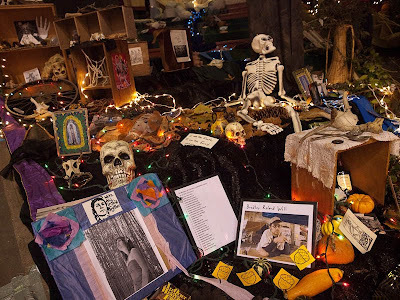 There are sugar skulls and toys for the children, emphasizing early on that death is a part of the life cycle, and the importance of remembering those who have passed on to another kind of life.